I really like the look of your site and its Delhi Escorts content. We wait for the latest from this site. I have limits your jumbling post. This is a striking business. I have respected the experience of looking post first time Jaipur Call Girls I pass on to the table central a dedication of appreciation is all together for this post. Much gratefulness to you. I was at the show in MA when they recorded When its Love, with Gary Cherone. Killer show during the Sam and Dave Tour. Sam and the Wabos blew Dave off the stage and into another concert!!! Absolutely love this CD and is what a Rock and Roll Show is all about. Thankyou Sammy. If I could wear out a CD's, this would be one of them. A great live which i listen at work all the time great sound quality and a great set list. Rock on Sammy. 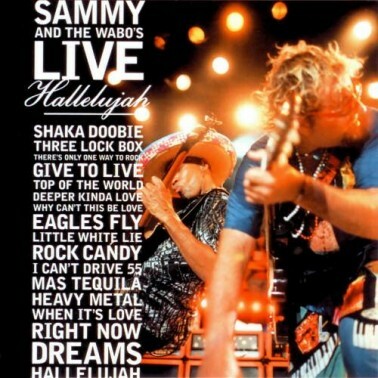 A really well produced LIVE record for one of sammy's first since quiting v-h band. A must own on the DVD-Audio format. One the most dynamic and entertaining hi-rez discs in my collection. A must own! Outstanding show on Channel 101 from Minnesota! Mona rocked it!